To make fish cakes: In a food processor, pulse the fish until it forms a paste. Transfer fish paste into a large glass mixing bowl. Add coconut milk, tapioca starch, egg white, sugar, green onions, salt and pepper. Mix all the ingredients until well blended. 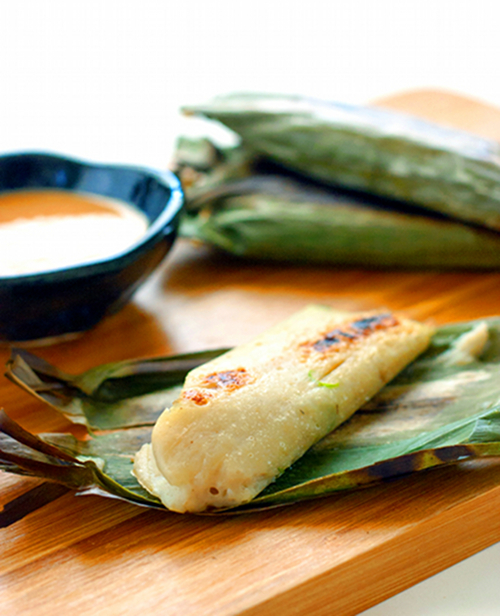 Take about 2 tablespoons of fish mixture and place it in the center of a banana leaf. Wrap the fish mixture by rolling the leaf tightly, and secure both ends with toothpicks. Trim the ends with scissors if necessary. Repeat the process with the remaining fish mixture. Place the fish packets onto the preheated grill and cook for about 15 minutes, turning them over after 6 minutes for even cooking. (If using the oven, place the packets in a single layer on a baking sheet, and bake in the top third of the 450 degree oven). 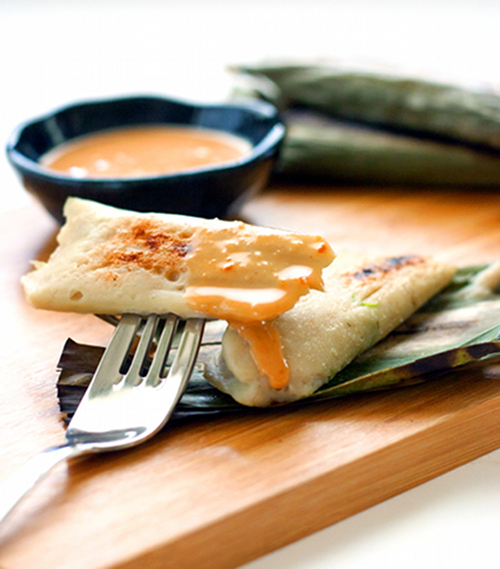 To make spicy peanut sauce: Place fried peanut and chili peppers in a food processor and pulse until smooth. Transfer to a bowl. Add water, sugar, lime juice/vinegar, water and salt. Mix all the ingredients together until well blended. Serve the fish cakes warm with the dipping sauce. Love the look of these. saw them on foodgawker. nice job. This is a phenomenal recipe. I've enjoyed these at restaurants before but never thought I could recreate in my own home. Well done.